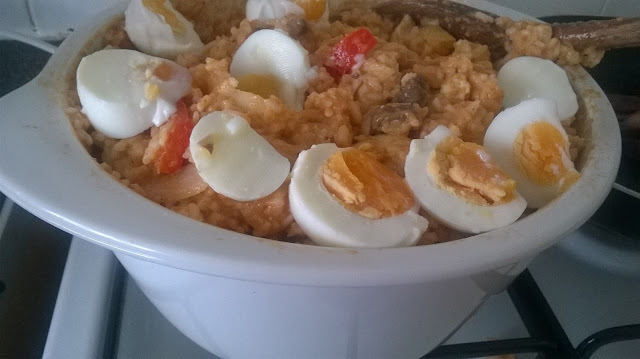 Today I made Valenciana (or, as we pronounce it in my hometown - balensyana). It turned out to be quite nice. To be honest I don't really remember what this is supposed to taste like as I wasn't a big fan of this when I was younger. When I was a kid, I avoided eating complicated dishes as much as I could. If there was sauce in it or sabaw, I think I would just shy away in a corner and hoped my mom wouldn't notice me so she wouldn't have to feed me - haha! I cooked this with coconut milk. I can definitely taste the coconut-y sweetness in it. I'd like to try other variations to it - maybe something saltier instead of sweet? But this was definitely a good first try. Valenciana for days!